Engaged in publishing of special-interest consumer magazines, applications and websites, also engaged in the operation of events in the areas of technology, games and entertainment; photography, and creative and field sports. Full Year Trading Update For The Year Ended September 2017 – Due to strong Revenue growth this is an “ahead of expectations” update – “The three acquisitions we have made during this financial year have further strengthened and diversified our revenue streams, as we continue to build a global platform for specialist media with data at its heart”. This additional Revenue should see the company announce its first Profit since 2013 this year – On a PER of 15.5 and up 200% in the past 12 months I wonder how much of this is already in the price! Final Results For The Year Ending September 2017 – Revenue up 43% to £84.4m (£59.0m last time), Operating profit of £0.8m (loss of £14.2m last time), EPS of 4.3p per share (loss of 59.6p per share last time). The Board is also considering paying a Dividend at the end of the current financial year ending September 2018. Good Revenue increase, a big turnaround from loss making into Profit and confidence in considering a Dividend payment. With the outlook in-line and in a growing industry this is going on my Watchlist, 320p. Results For The 6 Months To End March 2018 – Revenue up 25% to £51.1m (2017: £40.9m) with Adjusted EPS up 45% to 13.5p (2017: 9.3p). 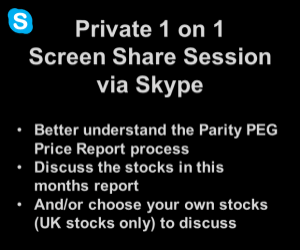 This was on my Watchlist at 320p – Having clearly missed out I am raising that to 400p now, at least to keep an eye out. Trading Update For The 12 Months To End September 2018 – FY EBITDA to be ahead of current market expectations. All core areas continue to show good revenue growth. Still remains on my Watchlist (400p) – Didn’t take the Entry recently, maintaining someCash – Remains on the Watchlist for now. Results For The 12 Months To End September 2018 – Revenue up 48% to £124.6m (2017: £84.4m), Statutory Operating Profit of £5.3m (2017: £0.8m), Reported EPS of 5.1p (2017: 3.7p (restated for rights issue)). Confident of continued strong growth. This has been on my Watchlist for some time and it will remain there for now – I will keep an eye out for revised forecasts and may be tempted although I am not a keen buyer in the present market environment. Trading Update – H1 to be significantly ahead of Boards expectations, also expecting FY to be significantly ahead of market expectations. I reckon this is fairly priced around these levels but will be keen to see any updated Broker notes after this upbeat statement.